Early this month I visited my relatives in Toyama Prefecture, which is located in the Middle District of Japan facing the Japan Sea. On that occasion I went to Toyama City and visited the Museum of Modern Art, Toyama. The exhibition entitled "A Beautiful Journey ... of Life" was being held there. It was a small but wonderful exhibition with about 70 works produced by about 60 artists and brought from different museums in Japan. The artists included Paul Cezanne, Harue Koga, Saburo Miyamoto, Claude Monet, and Pierre Auguste Renoir. The works were displayed under six themes such as "Beginning and Bonds," "Love and Passion," "Dreams and Universe," etc. Note added later: My works mentioned in comments on this essay can be browsed: sketches in Austria and the watercolor "Ashiya Catholic Church". I've never been to Toyama, but I assume it's a nice place. Well, here's my comment that I tried to post to your another HP. Your sketches in Austria really give off the European atmosphere, and I like the touch of color pencils. Out of those sketches, I like that of Traun River and the view from the Hotel Weitzer the best. I wonder if anyone came around and asked you what you were doing while you were drawing outdoor. Your watercolor of Ashiya Catholic Church made me feel so nostalgic. I lived in Kansai for about 20 years and experienced the Great Hanshin Earthquake there. 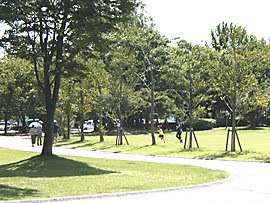 After that, I did volunteer work in many places in Hyogo, including Ashiya. I still remember walking all the way from Hankyu Ashiya stn. to Hanshin Ashiya stn. when those lines were not restored yet. The view of the Ashiya river is something very very special to me. It's so nice to find people who share the same interest with me. Please visit my blog once in a while and help me improve my artwork. Thanks for your kind comment. Oh, you experienced the Great Hanshin Earthquake. I'm afraid if you got some damage to your family or house. The original title of my painting "Ashiya Cathorlic Church ..." was simply "Church ..." Do you think that you could guess it Ashiya Catholic Church from the original title? I presented the two paintings of "Church" and "Museum of Art" at the exhibition of arts made by old boys and girls of Dalian Reizen Elementary School held in Tokyo last December. The 2004 version of that exhibition is to be held also in Tokyo from the 12th to the 18th next month. I prepared two watercolors again, and will post the images of them at my website after the exhibition. I'm glad that you liked my sketches of Traun River and a view of Graz, though the images are a little worse than the originals. I like the latter best among the sketches I made in Austria. But there was a problem. A car was drawn at the lower left corner of the original. It was too small compared with the two persons nearby. So I erased the car in the photo image. It is difficult for me to sketch moving things. Sure, I'll visit your blogs often. P.S. Please call me Tatsu, not sensei. Some Europeans come to me to look at my small work while I'm sketching outdoors. When I look back at them, they say, "Hi," "Beautiful," etc. Yes, I think I could've guessed it right even without the name "Ashiya" in the title, considering the fact that you live in Osaka. It's a very nice picture! My family wasn't affected by the earthquake because they all live in Shikoku. I was in Kansai living all by myself. My apartment survived without any serious damage, but I had to live without water and electricity for several days, and without gas for a few months. Thanks for your concern. I get so self-conscious and feel embarrassed when people come to me to see my sketch. Maybe I'll get over it eventually as I get more used to sketching outdoor (Hopefully.